The masked official in white protective gear and bright blue gloves grabbed a squawking hen by its legs, held it upside down and twisted its neck in one swift motion. 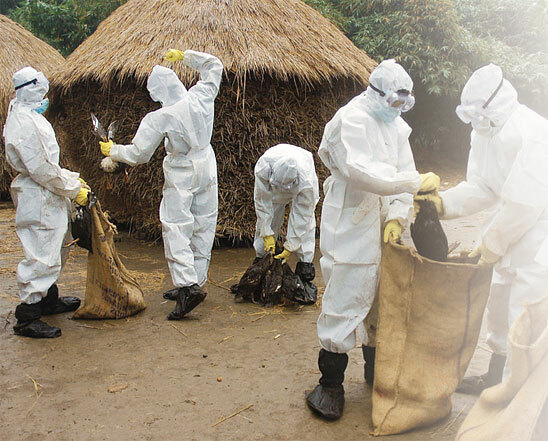 The bird expelled a mass of possibly contaminated faeces that sprayed the man's mask and faces of unprotected village boys crowding around. The writhing body was then dropped into a jute sack full of fowls with broken necks, crying out their death throes. The people carrying their fowl for culling were not given preventative Tamiflu tablets or masks. The area wasn't sanitized with bleach after the team left with sacks of dead birds. The crude culling in Dakhalbati village in Birbhum district's Rampurhat I block indicates West Bengal's lack of preparation in dealing with the crisis. Within a fortnight of the confirmation of the avian influenza outbreak on January 15, the virus had spread through 14 of the state's 19 districts. An estimated 132,625 chickens were killed, mostly backyard poultry.Despite the state government's claim that the situation was "under control" and more than three million chicks had been culled by February 3, the flu continued to spread. Not that there hadn't been adequate warning. In July 2007, the Union Ministry of Agriculture's department animal husbandry, dairying and fisheries (dahd) had called a meeting in Kolkata where animal husbandry authorities from all eastern and north-eastern states were present. They were warned of the risks from the bird flu outbreaks in neighbouring Bangladesh, where backyard poultry had been badly hit. Virologists had also warned that the floodplains of West Bengal were especially vulnerable to avian influenza. The large number of waterbodies and high humidity conditions are ideal for the infection to spread, they said. High density of poultry and human population upped the risk factor one notch. Birbhum district, for example, had over 3.2 million poultry and a human population density of 658 per sq km. Maharashtra's Nandurbar district, where the virus first cropped up in February 2006, had 3.1 million poultry and a human population density of 260 per sq km. Senior state animal husbandry officials confirm they had been on alert. "Poultry samples were sent for tests whenever bird deaths were reported in the past 10 months and over 3,500 samples had tested negative for bird flu until mid-January," says D N Banerjee, assistant director, department of animal resources development (ard). But these claims fly in the face of the state machinery's failure to act on early indications of the outbreak back in mid-December. Residents of Birbhum's Margram village, where the virus was first detected, say they reported chicken deaths to the block development officer and block livestock development officer as early as December 15. No action was taken. Again, on December 28, one Murshida Bibi of Margram's Mahipara hamlet had informed local officials that over 20 of her chicken had died suddenly. This time, the officials reported the matter to the Birbhum district magistrate. But it would be another fortnight before officials would come to Murshida Bibi's house to collect poultry samples to send to the High Security Animal Disease Laboratory in Bhopal. District officials did not impose the interim steps recommended by dahd after the samples were sent for testing there was no restriction on movement of poultry outside the affected area. Residents say poultry traders took advantage of this and quickly shipped chicken out, helping the virus spread. Culling operations started on January 16. Another week passed before the state acknowledged the seriousness of the crisis and sent senior officials to monitor containment operations. By then the virus had affected at least nine districts. ard department was forced to revise its culling target from the initial 0.4 million, the number had increased seven-fold to 2.8 million by January 29. West Bengal animal husbandry officials said the difficulty in pinpointing core outbreak areas had delayed containment. "The chicken samples sometimes did not come labelled, so we could not identify their origin," a senior ard official said. More to blame for the spread is the state government's inability to prevent chicken from being smuggled out of the affected areas and the ham-handed manner in which culling operations were carried out. There was a total lack of coordination between the ard department, district officials and the panchayats. The Down To Earth correspondent saw rapid response teams (rrt) in the affected areas waiting for hours for villagers to turn up with their fowl. In many areas, like Budge Budge in South-24 Parganas and Mahendrapur village in Birbhum, no panchayat official was on site to help the cullers, who had no idea where to start. Culling teams were often seen functioning without masks and sacks to carry the dead chicken. rrt members often had to face public wrath over inadequate compensation. At a press meeting, dahd secretary Pradeep Kumar said culling operations were constrained by the directions from the Union Ministry of Health and Family Welfare's (mohfw) against free movement of culling teams. The health ministry of course had sound reason people participating in culling operations had to be quarantined. A large section of the cullers themselves lacked basic information about the virus. Many refused to take Tamiflu pills, though who guidelines recommended a tablet a day for all rrt members while operations are on, and for another week to 10 days after the operation. Some of them told Down To Earth they refused Tamiflu because they suspected side-effects. On January 28, some 180 rrt personnel in Birbhum walked off without permission following an altercation with senior district officials about their quarantine stay. Though district officials tried to tell them they needed to stay under observation for their own safety, the men refused to listen. In yet another horrific safety lapse, thousands of culling team members were allowed to go home without spending the mandatory 10 days in quarantine, putting at risk their families and all other persons they came in contact with--only in Malda and West Midnapore were the cullers quarantined. A red-faced state government is now calling the men back to base camps in the districts where they will be isolated and put through tests. It has said that arrest warrants will be issued against those who leave without permission. Chicken and eggs continued to be smuggled to other parts of the state. On January 22, police intercepted two trucks full of birds at the Birbhum-Murshidabad border. The next day they caught a truck smuggling 9,500 chicks out of Bolpur in Birbhum. Having no other way to dispose them, authorities buried the chicks alive. On January 24, more than 150,000 eggs were confiscated at Rampurhat in Birbhum while they were being smuggled to the north-eastern states. Railway police seized five jute bags packed with country chicken on January 28 from a platform in Bandel station, Hooghly district. By January 31 the health ministry had supplied 420,000 capsules of Tamiflu and 150 bottles of Tamiflu syrup to the state. But out in the affected areas, the drug was unavailable to villagers who were most at risk. It wasn't found at most primary health centres as well. Private pharmacies in any case did not have the drug--only the government procures it. The state health department set up three-person teams to conduct door-to-door health surveys to identify possible human infections. Most surveyors were local youth with little medical expertise. Improvized "isolation wards" in local hospitals and health centres, set up to treat human infection cases, lacked specialized doctors and basic equipment like ventilators and nebulizers. More than a week into the outbreak, equipment sent from Delhi, including 20 ventilators and 10 semi-automatic analyzers, were gathering dust at health department premises in Kolkata. In Bolpur, the department set up a 10-bed isolation unit in an abandoned house that was once a police morgue. Panabakka Laxmi, union minister of state for health, was shocked when she visited the unit on January 20. She called it a bhoot bungalow (a haunted house). The unit was later shifted. The referral centre for human infection, Infectious Diseases and General Hospital in Beliaghata, Kolkata, has only 40 beds in its isolation unit. Despite official claims of setting up a separate respiratory care section with adequate ventilators and pulse oxymeters, all that could be seen in the wards until February 1 was bare metal beds. Senior doctors said they would install the equipment when the need arose. For over a week into the outbreak, all phonelines at the hospital were down. Hospital staff and doctors were seen using cellphones to communicate with the health department. Sanchita Bakshi, state health services director, maintained the state's health department was doing the best it could under the circumstances, given that West Bengal had never seen bird flu before. Shyamalendu Chatterjee, virologist with the Indian Council for Medical Research, pointed to the state's unpreparedness "West Bengal simply didn't have the equipment required to diagnose avian flu." Many experts say the H5N1 strain of avian influenza virus ravaging West Bengal came from Bangladesh through the illegal poultry trade. But the High Security Animal Disease Laboratory is yet to come to any conclusions. "We have not yet sequenced the West Bengal virus because diagnosing is our first priority. Samples are being collected and an analysis of the genetic sequence would tell us about the likely origin of the virus," the laboratory's joint director S C Dubey said. This would also help determine whether the virus spread despite the ban on poultry movement across borders or that it got into Bengal through some other route. State authorities have avoided commenting on crossborder traffic, saying it was the centre's responsibility to find out the source of the outbreak. "Cattle are smuggled into West Bengal despite the presence of the Border Security Force. We can't help if chicken are also smuggled in. We had told the centre that the border had to be sealed but it was not done," says ard minister Anisur Rahman. West Bengal now blames the centre for not warning it about the risk to backyard poultry following the Bangladesh outbreak. "They had told us to keep a strict vigil on organized poultry farms but we did not realize the threat to backyard poultry," says Rahman. Central government officials contend that they hadn't made any distinction between vulnerability of organized farms and backyard poultry. The external affairs ministry has asked the Bangladesh government to share the genetic history and information of the Bangladesh virus and also to develop a joint system to dispose dead poultry.On January 30, a border security force team reported that Bangladeshis were seen dumping dead birds in the no-man's land along the border. who's International Health Regulation (2005) that came into force in June 2007 requires countries to share information on the avian influenza virus. "But we do not have access to information from Bangladesh," says Dubey. Thirty out of Bangladesh's 64 districts are officially battling avian influenza. In January, the country reported some 25 outbreaks, but reports said only about 350,000 birds had been culled so far; compare this to the 3.2 million culled in West Bengal in a fortnight. Union health minister, Ambumani Ramdoss, said Bangladesh hasn't been transparent about its control and containment measures. "I won't be surprised if the number of districts affected is higher than that announced by officials," he said. The Rs 5,000-crore organized poultry industry in West Bengal has taken a bad hit. Losses could mount up to Rs 1,000 crore in the organized poultry sector alone, says Dilip Chakraborty, ard principal secretary. Losses suffered by self-help groups and backyard poultry farmers are yet to be fully assessed. State officials say over 600,000 poultry rearing families have been affected and they have incurred a total loss of about Rs 150 crore. 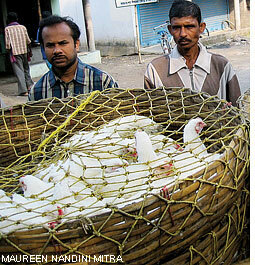 Country chicken usually sells at Rs 80 to Rs 100 each and is an important source of income in rural West Bengal. But villagers are given only Rs 40 as compensation for a full-grown bird. "Backyard chicken is reared mostly by women from the lowest socio-economic strata. So chicken dying is a great blow to them," says Kolkata-based ecologist Shilanjan Bhattacharya, who's been studying the relationship between rural economies and ecology. The chief minister has sought the centre's assistance for compensating the affected families and providing them alternative sources of income like goats and pigs, plus subsidized poultry feed ingredients. "Short-term loans will be changed to long-term loans for those affected and the centre will be requested to waive loans taken by poultry owners who are below the poverty line," says state finance minister Asim Dasgupta. After the mandatory three-month quarantine, the state will offer soft loans at 4 per cent interest to buy fresh stocks from "safe" state-owed farms. Rahman said every member of poultry self help groups will be given 10 chickens. Since poultry can't be reared for another three months, the state government is planning to offer jobs to at least one member of each family for this period under the National Rural Employment Guarantee scheme. By February 3 the state government was claiming that rrt had culled about 3.2 million poultry and destroyed 342,255 eggs and 73,743 kg of poultry feed. Culling operations were drawing to an end. There was talk now of a seven-day mop up operation to search houses for hidden poultry and disinfect affected areas. But the virus refused to be contained. 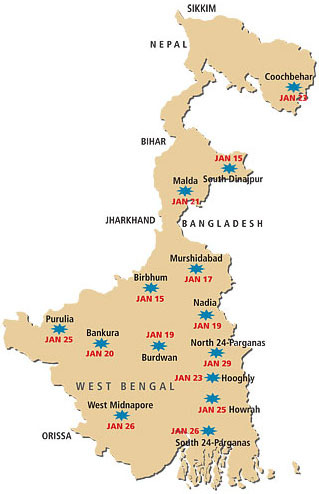 Notwithstanding chief minister Buddhadeb Bhattarcharjee's order that culling operations be wrapped up by February 2, the deadline had to be extended by two days following a fresh outbreak in Canning, South-24 Parganas. The centre is now planning to create a protective ring to check the virus from spreading to the contiguous states of Orissa, Jharkhand and Assam--a move that will require culling of poultry within a 5 km radius of West Bengal's border with these states. H5N1, the lethal avian influenza virus strain, was first reported in 1996 in China. The virus was transmitted to humans during an outbreak in 1997 in Hong Kong. Nineteen people were affected. Since then, it has struck with alarming frequency, affecting both humans and birds. It has claimed nearly 250 people across the world since 2003.60 countries have been affected so far; five in 2007. H5N1 has become persistent in Egypt and Indonesia. 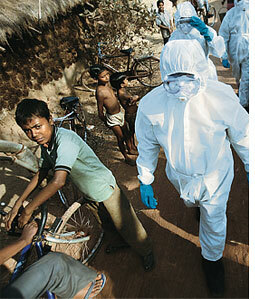 "Bird flu sweeping continents is a danger signal. The number of deaths is high considering the disease is not supposed to afflict humans. Chances of pandemic are rife," said Rajan Patil of the division of epidemiology at the School of Public Health, srm University, Kanchipuram, Tamil Nadu. But the speed at which the disease can spread is in the realm of speculation.Timm Harder of the Institute for Diagnostic Virology at the Friedrich-Loeffler Institute, Germany, said, "It is not clear if H5N1 will cause a human pandemic. There is greater risk when more humans are exposed. H5N1 has already assumed pandemic proportions in poultry." A study by researchers of the High Security Animal Disease Laboratory, Bhopal, showed that the virus which struck Maharashtra, Gujarat and Madhya Pradesh in 2006 had a Eurasian lineage and came to the country via China. Experiments on chicken and mice have shown that H5N1 has become more lethal compared to 1997. Studies have showed that the virus has developed several deadlier sub-strains. In May 2007 who sounded alarm bells it announced that an avian influenza pandemic was inevitable and that the world should be prepared for it. An international ministerial conference was convened in December 2007 in Delhi to assess the world's preparedness. The union agriculture and health ministries were asked to present a roadmap to check bird flu. The document presented at the meet was based on the country's experience in successfully containing outbreaks in Maharashtra in 2006 and Manipur in 2007. "The government's containment measures were more intensive than those known to be followed internationally," minister Ramadoss had said. It's true that avian flu had been checked in Manipur in 10 days. But the outbreak was of a far lower scale then--a small farm of less than 150 birds--and the lessons learnt from it didn't evidently help check the pestilence in West Bengal. This didn't stop Ramadoss from exuding confidence "The number of birds dying is going down. The disease has not spread to humans. We have banned transport of poultry between states and districts." Besides the roadmap, the country also has an Action Plan for Preparedness, Control and Containment of Avian Influenza, drawn up in November 2006. Both documents recommend active surveillance as a bird flu control measure. The cabinet secretary is supposed to monitor the country's preparedness on a monthly basis. The prime minister, and the union health and agriculture ministers are also supposed to keep regular vigil and states should have a system of regularly testing birds for the flu virus. But testing has obviously not been up to the mark, as the West Bengal experience shows. Cabinet secretary K M Chandrasekhar pointed out as much in a letter to the chief secretary of states on January 17. The letter noted that feedback from states suggested that surveillance needed to be stepped up. But the West Bengal case showed that the onus was on the public to report mass poultry deaths to local veterinary authorities, which were slow to respond. The national plan requires that samples be sent for testing at the earliest. Testing takes about 24 hours. But the West Bengal veterinary authorities took more than 10 days to find out if the birds were dying of avian influenza. The authorities initially ascribed the deaths to the Ranikhet virus, also called the Newcastle disease virus. The H5N1 virus is often confused with this virus because it also causes influenza and leads to high mortality. But only in birds. Laboratory confirmation is required to distinguish h5ni from Ranikhet Virus. This was not done early enough in West Bengal. While the initial detecting mechanism remains inadequate, the country is not short on surveillance programmes (see box Check them out). But most of these put the impetus of reporting bird flu cases on the public. Surveillance programmes also require funds. At the New Delhi ministerial, international donors pledged us $400 million to combat bird flu-in addition to the us $2.3 billion pledged at earlier ministerial conferences at Beijing and Bamako in Mali. Earlier, most of the money was provided as grant (see graph Stingy donors). 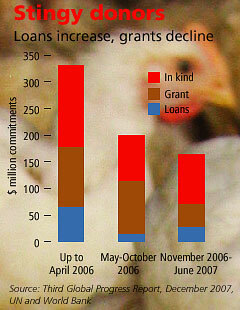 Now grants are fewer to come by and developing countries have come to depend on loans. But the loans even are not readily available-of the us $983 million committed by donors, approximately us $600 million wasn't disbursed by end of June 2007. At the ministerial, Ramadoss asked the funding agencies to increase grants. Money is important. But the scores of prevention and control strategies in the policy books of the government have to be implemented for the money to count. For that, there must be an efficient system to track animal health. West Bengal-in fact most places in the country-is ideal breeding ground for H5N1. Infected birds live in close proximity with people here. It would be preposterous to believe that the country would somehow escape the disease that is killing thousands of birds across the border in Bangladesh. 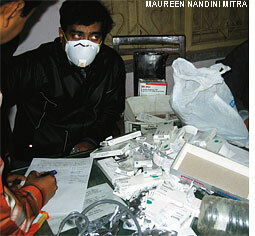 In West Bengal, health authorities did not act till bird flu assumed menacing proportions. That was because the onus of reporting the disease was left to the public. It's a ludicrous strategy farmers with infected birds are unlikely to report the affliction because that will hit their livelihoods. That's exactly what happened in West Bengal poultry farmers tried to minimize losses by transporting the 'seemingly' healthy birds outside the affected areas. There is a lesson in this failure without a strong veterinary support system and compensation mechanism, the country will remain vulnerable to avian influenza.